One animated TV series just got a little longer in the tooth. Disney Junior has renewed its Vampirina TV show for a second season. The children’s musical fantasy just premiered in in October of last year. Disney has not yet announced a season two premiere date. 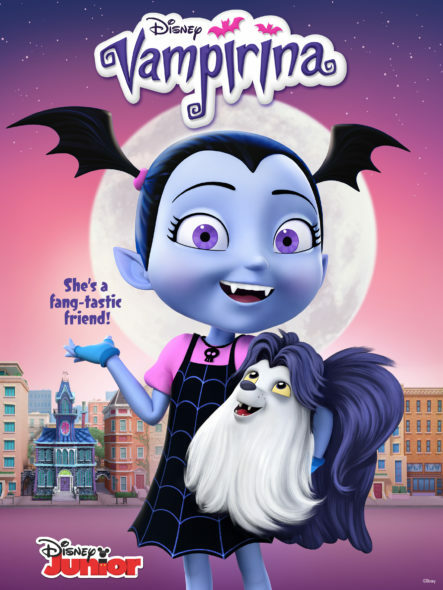 An animated TV series, Vampirina centers on Vampirina Hauntley (Isabella Crovetti), a unique little girl who just wants to fit in with her new schoolmates. Lauren Graham and James Van Der Beek voice her parents, Oxana and Boris. The Disney Junior voice cast also includes Wanda Sykes, Mitchell Whitfield, Jordan Alexa Davis, ViviAnn Yee, Dee Bradley Baker, Benji Risley, Cree Summer, and Ian James Corlett. Learn more from this Disney press release. Disney Junior has ordered a second season of “Vampirina,” starring Lauren Graham, James Van Der Beek and Isabella Crovetti as the Hauntley family, friendly vampires who have recently relocated from Transylvania to Pennsylvania. The first vampire series for preschoolers, “Vampirina” blends spooky fun, heartfelt storytelling and Broadway-caliber music and follows Vampirina (aka “Vee”) as she faces the joys and trials of being the new kid in town, including making friends and attending a new school in the human world. The announcement was made today by Joe D’Ambrosia, senior vice president, Original Programming, Disney Junior. An out-of-the-gate hit for kids and families, the Oct. 1, 2017 simulcast premiere of “Vampirina” on Disney Channel and Disney Junior ranked as the preschooler platform’s highest-rated new series premiere, in close to one year for Kids 2-5, Kids 2-8 and Adults 18-49, since the January 2017 premiere of “Mickey and the Roadster Racers.” To-date, the series has delivered over 90 million views across Disney apps, VOD, social media and YouTube platforms. Globally, the series has reached over 49 million total viewers and ranks #1 among key young kid demos in the U.K. and Italy. The series is available in 115 countries and 15 languages. Extensions for the series include: multiple storybook and early reader book titles; comics and a magazine from Disney Publishing Worldwide; a DVD from Walt Disney Studios; as well as a Vampirina product line from Disney Consumer Products and Interactive Media, which includes the Scare B&B Playset, a popular item during the 2017 holiday season. New products will debut later this spring. “Vampirina” will also be featured in the upcoming “Disney Junior Dance Party On Tour” live concert experience launching March 14. “Vampirina” airs daily on Disney Channel and Disney Junior and is also available on the DisneyNOW app. In addition to Graham, Van Der Beek and Crovetti, the series stars Wanda Sykes (ABC’s “black-ish”) as Vampirina’s cantankerous yet loyal gargoyle sidekick Gregoria; Mitchell Whitfield (“My Cousin Vinny”) as playful ghost, Demi; Jordan Alexa Davis (“Sofia the First”) as Vee’s best friend and next-door neighbor, Poppy; ViviAnn Yee (“The Boss Baby”) as another one of Vee’s close friends, Bridget; Dee Bradley Baker (“Phineas and Ferb”) as Vee’s teacher, Mr. Gore, and the Hauntley’s dog, Wolfie; Benji Risley (“If You Give a Mouse a Cookie”) as Poppy’s twin brother, Edgar; Cree Summer (“A Different World”) as Poppy and Edgar’s mom, Edna; and Ian James Corlett (“Dinosaur Train”) as Chef Remy Bones, the Scare B&B’s resident skeleton chef. Inspired by Disney Publishing’s popular children’s book series “Vampirina Ballerina,” written by Anne Marie Pace and illustrated by LeUyen Pham, the series includes leaders from the creative team on Disney Junior’s Peabody Award-winning animated series “Doc McStuffins” including executive producer Chris Nee and co-executive producer Norton Virgien. Broadway composers Michael Kooman and Christopher Dimond (“The Noteworthy Life of Howard Barnes”) are the series’ songwriters and Layla Minoui (“Castle”) is the composer. The series is produced by Academy Award®-nominated animation studio Brown Bag Films in association with Disney Junior. What do you think? Does your family watch the Vampirina TV series? Do you plan to tune in for the second season on Disney Junior? More about: Disney Junior TV shows: canceled or renewed?, Vampirina, Vampirina: canceled or renewed?